Looking for an affordable, high-quality speaker with a complete power house features, then take a look at August WS300 Wi-Fi multi-room speaker. August is continually challenging industry-leading manufacturers of home speaker products with this its new addition to the family. 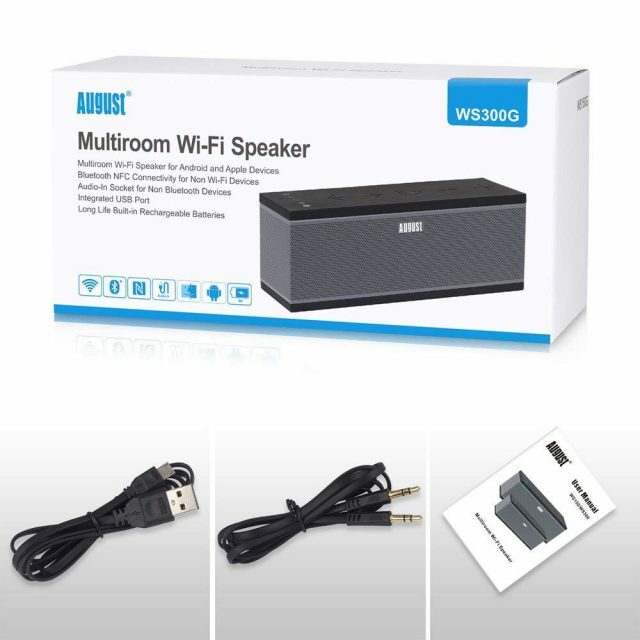 Unlike most speakers that connect via Bluetooth, the August WS200 connects via Wi-Fi and provide you a multi-room speaker system within your home or office. Weighing just 1.28 kg (2.8 pounds), the August Aiplay Speaker is rectangle in shape and measures 25.6 * 8 * 13.5 cm. The top is flat, covered with a soft touch material and houses the easy-to-use, largely marked rewind, forward, play/pause, volume up and volume down control buttons. Also at the top are indicator lights for WPS, Wi-Fi, continuous play, Bluetooth and shuffle play. The unit’s sides is covered in speaker mesh and it comes in color gray. With an output power of 15W, the August WS300 consumes less power than the Sony X5. Its internal battery can last for 14 hours while that of the Sony can last for 8. On the back of the device is the OFF/ON switch, power connector jack and 3.5 mm cable connector port. The August Wireles Speaker is loaded with a number of simple yet impressive features that enables you enjoy music conveniently and with ease. 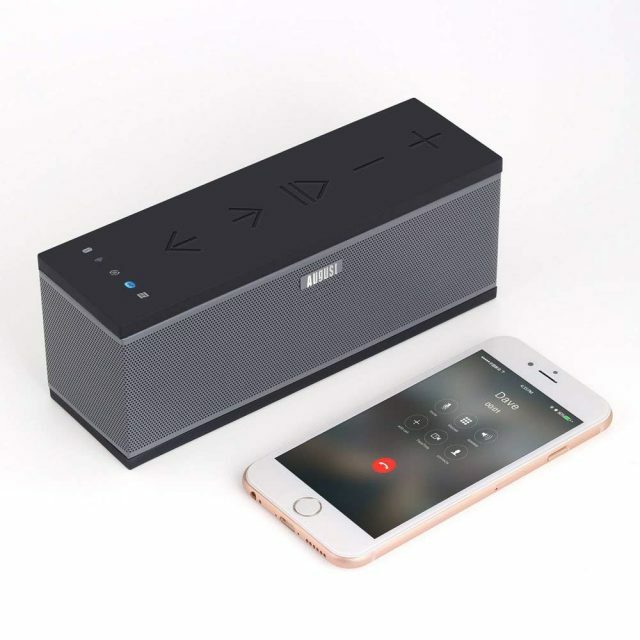 Connectivity: The August WS300 Wi-Fi multi-room speaker can connect to other devices through Bluetooth or by Wi Fi. It can also connect to other devices through the 3.5 mm cable. The Wi-Fi operates on 2.4 GHz band and may not be able to connect to 5 GHz devices. 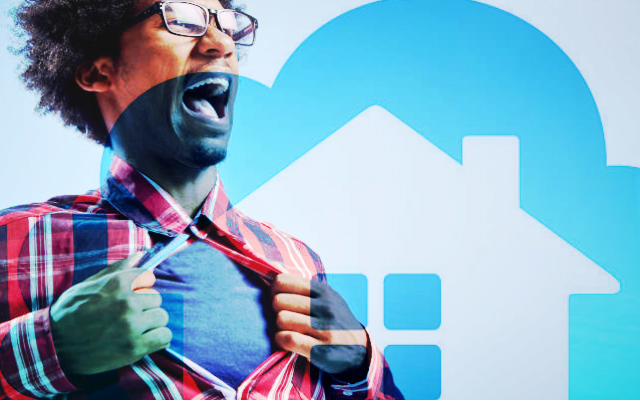 Once connected to your home network, you can control the speaker from anywhere in your room without necessarily being close to the speaker. 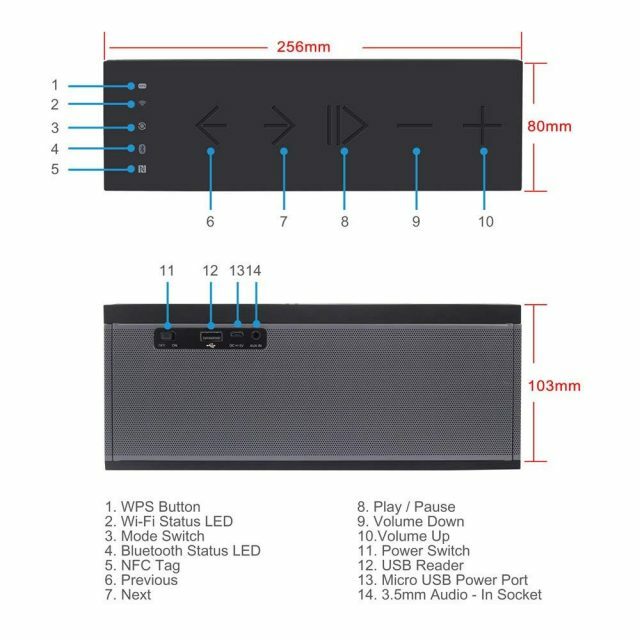 Majority of the speaker’s features are available when connected to Wi-Fi and not by Bluetooth. Setup/App Controlled: The speaker is controlled by the August app which is available on Android and Apple, as well as Airplay. The app allows you to stream music from music sites, stream same or different music across multiple speakers in your home, and control the volume of each speaker. This app is intuitive and easy to use. Steam Music: You can stream music from Pandora, Spotify, Tidal, iHeartRadio, Tuneln through the August app or you can simply stream music from your mobile phone. Other music streaming sites include TTPOD, QQMUSIC, XIMALAYA, Douban FM and QINGTING FM. Multi-speaker network: Speakers can be set up individually or in a multi-room speakers’ setup. You can connect up to four WS speakers in one setup. In a multi-room setup, you can combine more than one speaker in a room to create a rich, stereo sound effect (by assigning which speaker plays L+R, left or right channels) or you can place individual speakers in different rooms but in a multi-room setup. You can stream either the same music across all the speakers or different music on each speaker in your network. For example, you may be playing a soothing and gentle music in a subdued volume in your nursery while the baby sleeps and at the same time be enjoying some entertaining music in the living room or in the kitchen while you prepare dinner. However, if used separately as individual speakers, you will need a separate paid service account for each speaker to stream music. Only one of such account is needed if the speakers are paired in a multi-room setup. Pricing: Surprisingly, despite its unique features, the August WS300 is cheaper than most other brands in its league. At a modest price of $88.95, this is definitely a very good value for your money’s worth. The Sony XRS-X5 sells on Amazon for $149.99 and the Bose SoundLink for $109. Good, rich sound quality. 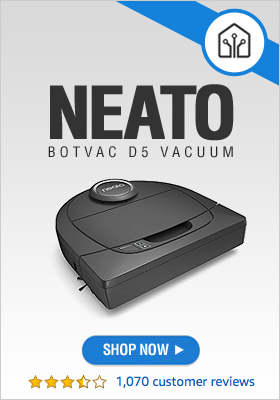 Great and impressive features. Easy to use and control. At an affordable price. That, in effect, sums up the August WS300 multi-room Wi-Fi speaker that makes it a worthy addition to your home or office. Get Your August Multi room Airplay Speakers Now! Get Your August Multi room Wireless Airplay Speakers Now!